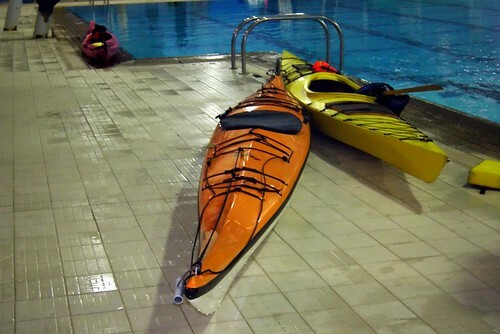 First off, I owe Peter at Pacifica Paddlesports a HUGE thankyou for all his help tonight and hosting a really great night of paddling at the pool. Tonight it was myself, Paula and Bernie and we did rescues until we were blue in the face. Bernie showed me a variation of the T rescue where the second paddler doesn't need to put weight on the stern. We also practiced scoop rescues and bow step rescues. Even got a solo or two in there. Tried rolling a bit, but I think I need professional help on that front. No matter how slow I take it or how much I think about righting myself, I end up only doing half a roll :). I'll get it soon enough - good things come with time and patience.